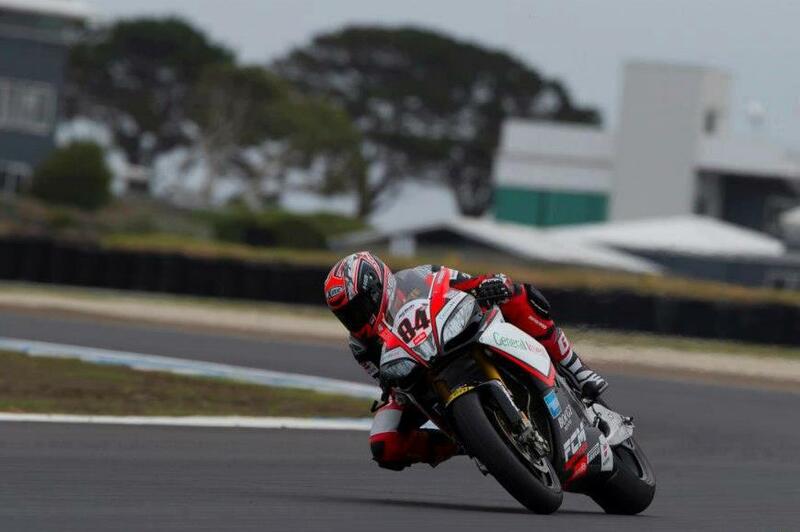 Michel Fabrizio has shown that this mornings fastest time was not a one off, as he has topped the first qualification practice session at Phillip Island. Followed by factory Aprilia man Eugene Laverty by just under eight hundredths of a second. BMW’s Marco Melandri who led most of the session placed 4th with Crescent Suzuki’s Leon Camier in 4th leading a line of Brits, Davies 5th, Haslam 6th and Tom Sykes 7th. Guigliano and Guintoli took 8th and 9th respectively, meaning all four Aprilias made it into the top ten. Wildcard Jamie Stauffer continued to impress in 11th, ahead of 2011 champion Carlos Checa who had to stop during the session due to dizziness. Max Neukirchner rounds out the top 13, who were all within 1 second of eachother, showing that WSB could very well be seriously competitive. Riding wounded Loris Baz, Ayrton Badovini and Jules Cluzel are much further down the field than would be expected. The superbikes are back out on track tomorrow for the second qualification practice, followed by a free practice and then Superpole, which will be broadcast live on British Eurosport from 04:30 GMT. Next Next post: Davies: "I am starting to feel the bike is mine"